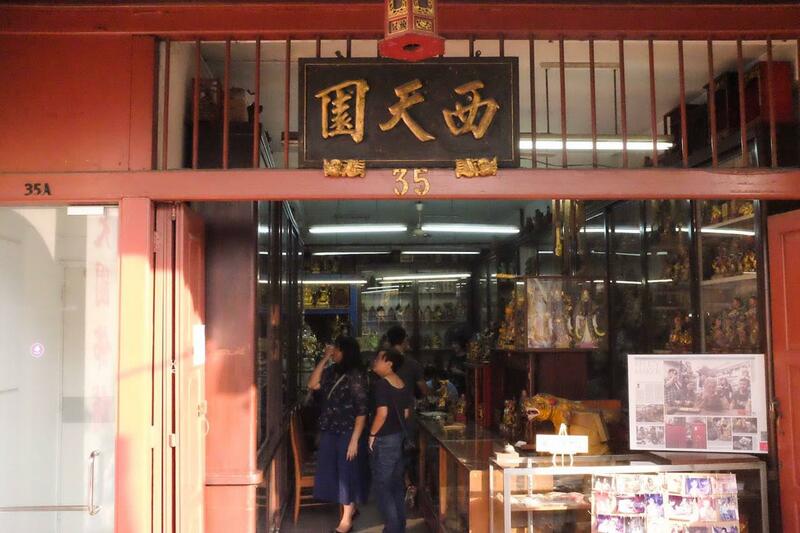 On a hot, blistering Saturday, I traipsed my way across Chinatown towards 35 Neil Road. 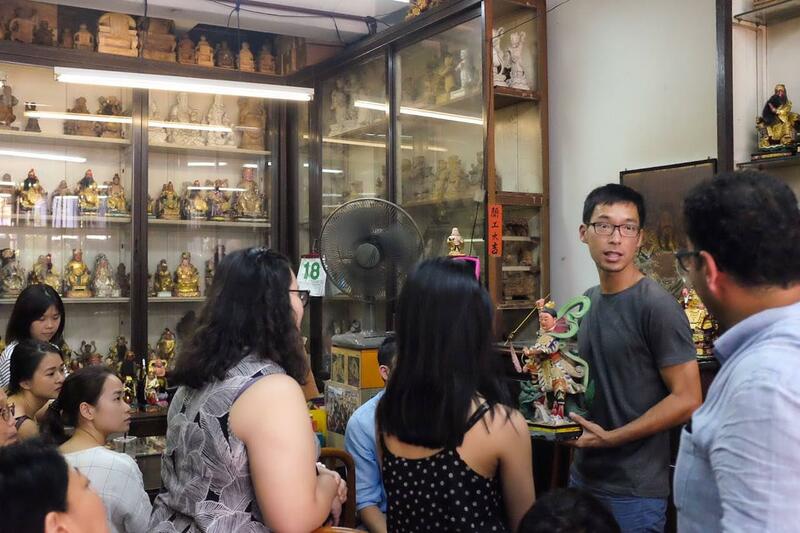 When I finally reached the cool and comforting shade of Singapore’s last Taoist deity shop, Say Tian Hng, the Airbnb Experience had already started. 38-year-old Ng Tze Yong was in the midst of narrating a moving tale of Ne Zha to the cosy group of an audience as I slipped in. 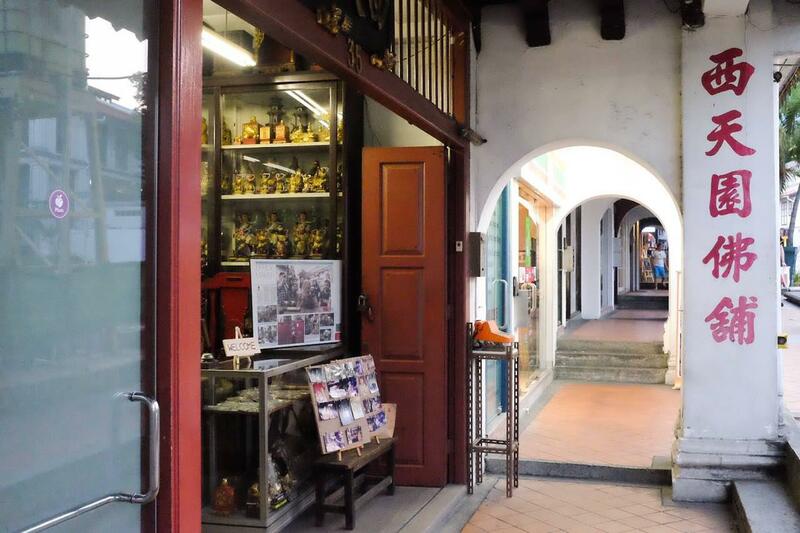 Tze Yong and his 35-year-old brother, Tze Chong, are the fourth-generation owners of a family business that’s over 120 years old, and I had the opportunity to experience a little bit of Singapore’s history in action. 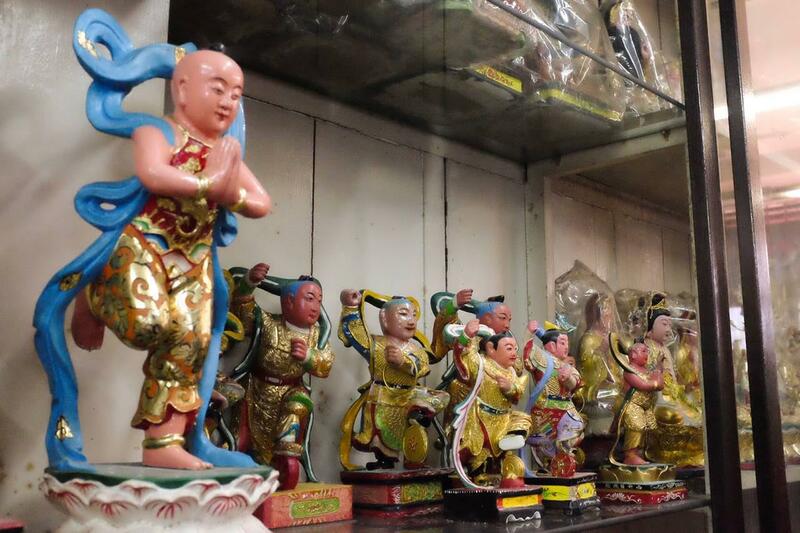 Tze Yong’s stories of Ne Zha, also known as the Third Prince, and Guan Gong, the God of War, were different from the legends and lores showed on TV. In mainstream depictions of these gods, their virtues and godlike feats are lionised; their failures and mistakes end in redemption, and we see them as immortals and deities to be idolised. To be clear, Tze Yong did not alter their stories, rather, he told them in a way that’s humanising. When he was doing his research, he found that “people who are banana*” (*slang for those who aren’t proficient in Mandarin) like him have difficulties accessing this “rich part of our culture”. 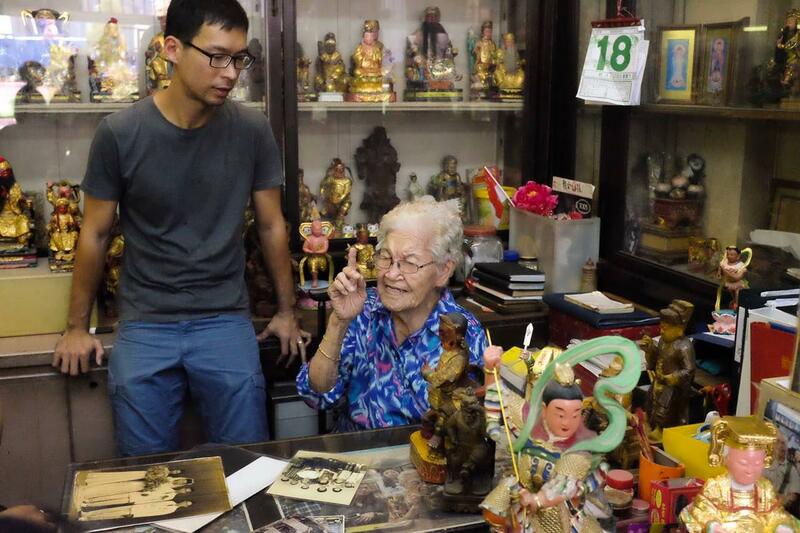 He later explained to me that stories about say, Guan Yin, the Goddess of Mercy, are often told in a “Chinese narrative style” which focuses on genealogy. “Like, [they’ll say] she was the daughter of so-and-so, who lived in what province, in which year… It tells you about the family tree which was [hard to relate] so I had to look into that,” he shared. 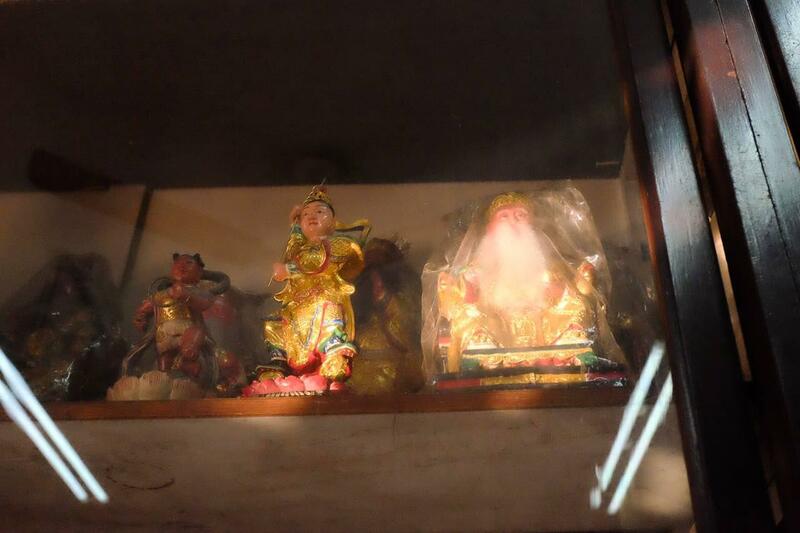 “That, then, makes the story come alive beyond devotees’ perspectives,” he said knowingly. 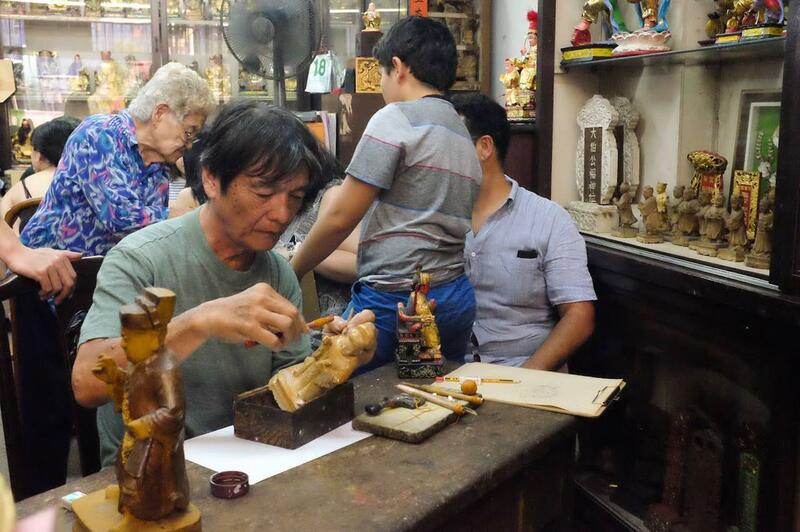 He showed us how a solid block of camphor wood is transformed into an impressive statue of a Taoist deity and the different tools used, holding up chisels and metal spatulas that were possibly present when the shop was first established in 1896. 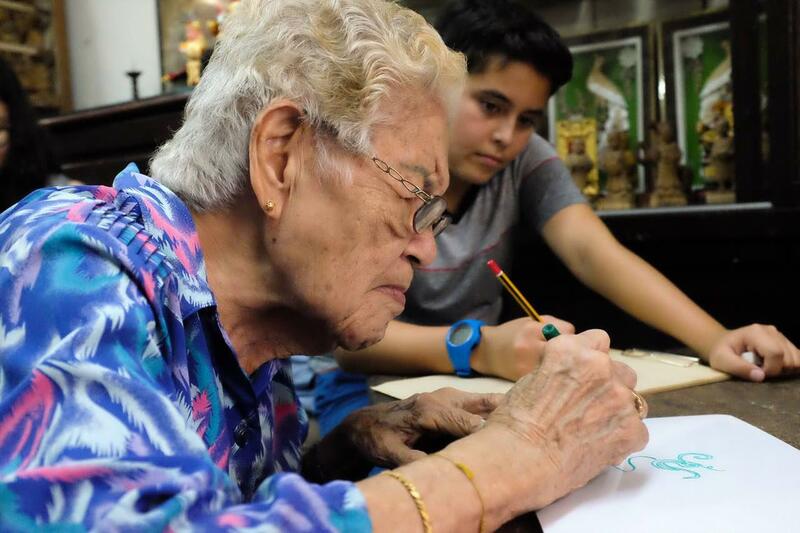 He then invited his grandmother, 87-year-old Tan Chwee Lian, to teach us how to draw a dragon motif. After that, Ah Ma was given an unfinished effigy, some tools, and a dough-like material to demonstrate how she makes the filigree. She carefully applied the strand of dough onto the surface of the effigy, recreating the dragon motif she had just shown us. 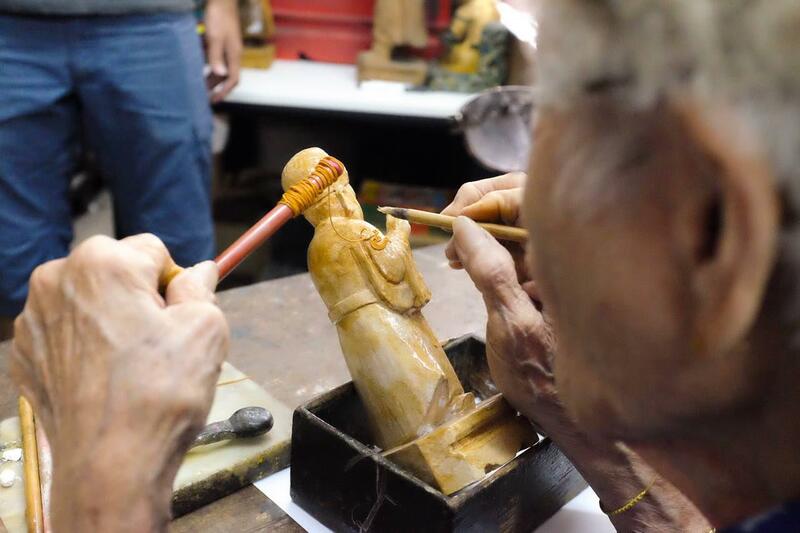 A fully-made effigy takes about a month to finish and can cost between $1,000 to $2,500, while an unfinished one of the same size will cost half the price. They look at these as a work of art not a work of worship. They see history, they see a story and the imperfections make them even better. He shared that it’s the “odd tourists” who find them. “[To them], this is like a secret shop and they found something that only [they] got and everyone else got the Merlion chocolate,” he laughed. He explained that when foreigners see an effigy painted in gold or bright red, green, and purple, they think it’s gaudy and it’s clear to them that that’s for worship. “But if you change it to pastel colours, and maybe you don’t paint the whole thing, just certain parts you want to accentuate. Then it is explicitly secular,” he said. Perhaps these symbols of our culture could end up sitting on a dining table in San Francisco, or as an artwork on a mantelpiece in a home in London. “Most importantly, how do you allow the story to come true because it’s meaningless if you do not know the story,” he added. 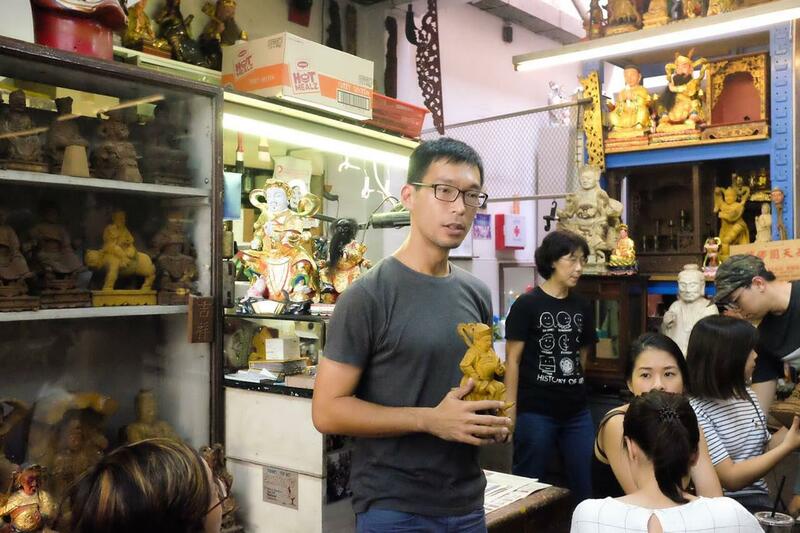 Tze Yong believes that without the story and the values tied to it, the statue becomes just another piece of mass-produced decoration. One of the considerations to keep the business sustainable is finding a new market to add to the existing one, and to reach the new market, Tze Yong thinks they have to have a new product. But that new product shouldn’t depart too much from its core, he said. “We could use the filigree and we can make different designs, maybe make a dragon or write your name, but is something lost there? Maybe it works, maybe it won’t – it’s a balancing act,” he mused. Tze Yong shared with me that he’s also interested in exploring the possibilities of organising design competitions. 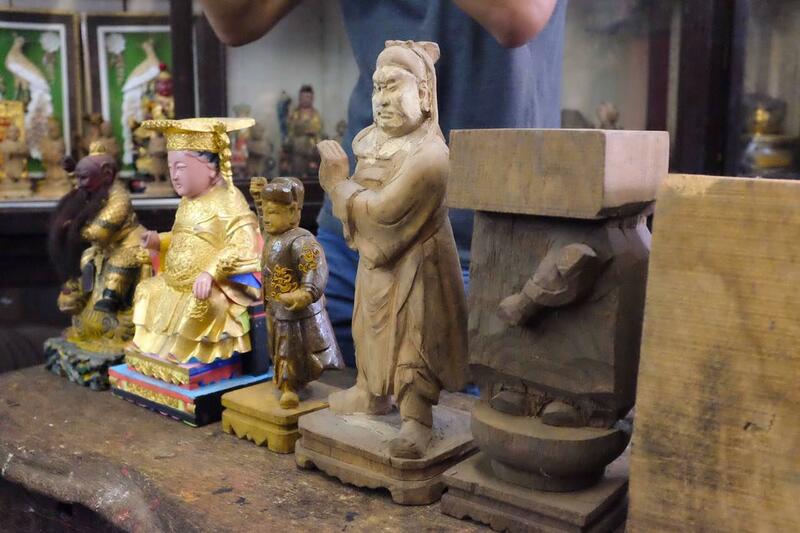 They could approach the Hokkien clan in Singapore or the Kim Mui clan, collaborate with the National Heritage Board (NHB), and have designers and design students reinvent an effigy. The panel of judges could include his former lecturer at Parsons, a renowned designer, someone from the NHB, and even Ah Ma, he said happily. But he thinks that they’ll need to sit down to think about it. 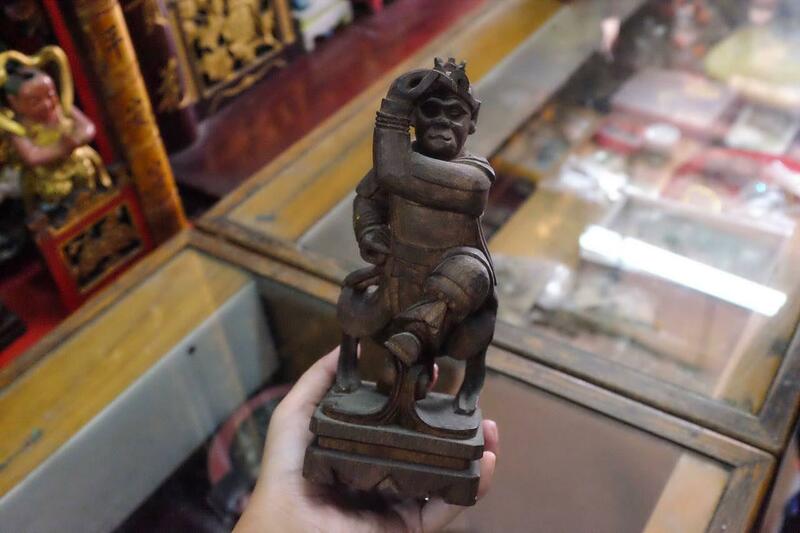 The Airbnb Experience is part of the Ng family’s efforts to preserve the craft of effigy-making and to breathe new life into the business. It was initially a final year project for Tze Yong’s Master’s degree at Parsons School of Design in New York, and the first four tours they conducted were promoted on Facebook. After he graduated, he decided to “pop it into Airbnb Experience” with the support of his family. “I used this shop as a case study to look at how to design, how to reinvent this business for the 21st Century,” he told me. The father of two young daughters is also the CEO of Equal-Ark, a local charity group that helps at-risk youth through animal therapy. He wants to get the word out about Say Tian Hng and meet people and be inspired. A visit to Say Tian Hng through the home-sharing platform is relatively wallet-friendly at $48 a person. “Actually, we used to be cheaper – $15. Then we looked at everyone else and they were like $70 to $150, so we thought maybe it looks a bit [suspicious],” he laughed. 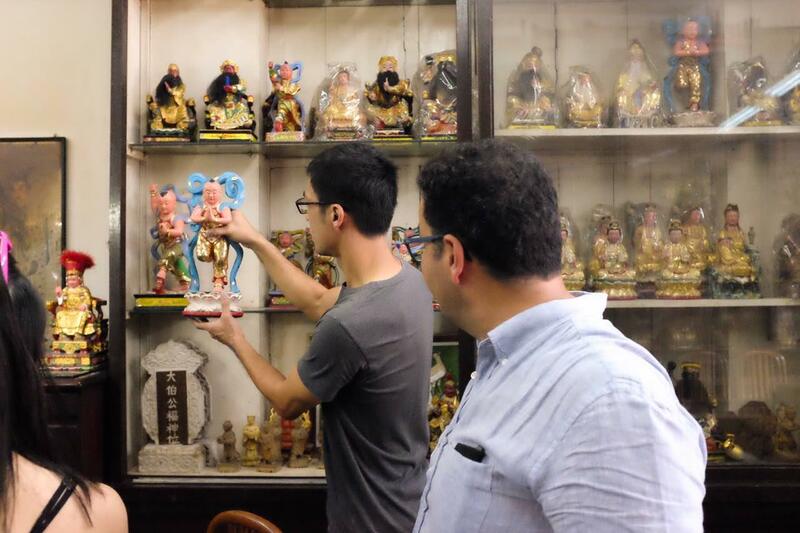 Another reason why he’s decided to put the shop up on Airbnb Experience is to help his father and grandmother think about the future of the shop. Most of the time the shop’s pretty quiet and there is only a trickle of regular customers. But once a month for two hours, we have people from Spain, England, and young Singaporeans coming in. “When we first started this a year ago, she never thought she had anything that would make people want to come and learn. But now when people interview her, she’s very happy to share,” he continued. “Three days!” they said in unison. 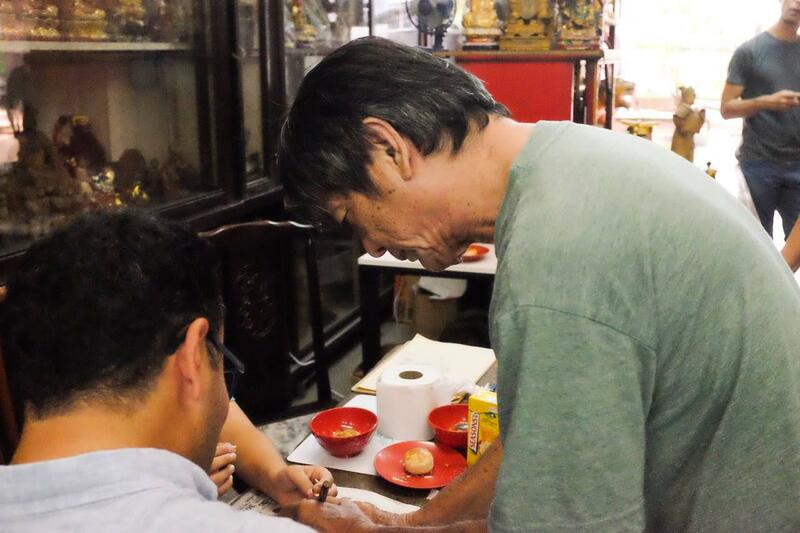 Technology is so advanced now that travelling to the moon takes only that amount of time, but it took Tze Yong’s great-grandfather and his brother one month to come to Singapore from their hometown in Kinmen Island, a place in Fujian, China. 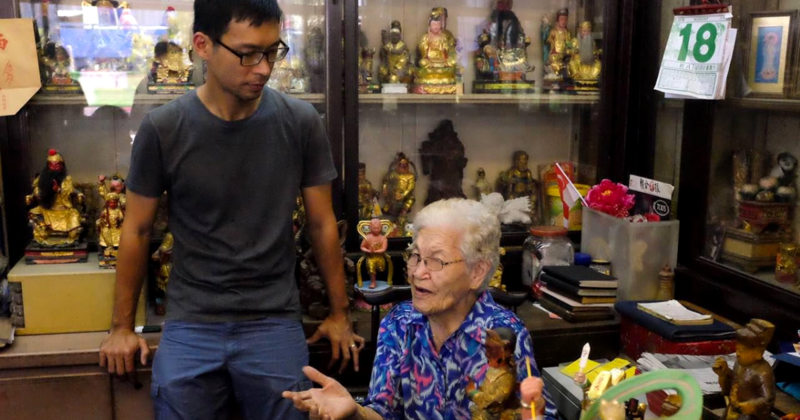 They arrived here and set up shop, but Tze Yong’s great-grandfather later decided to go to Thailand to run his own business and settled there, while his brother stayed in Singapore. When his brother passed away from an illness, Tze Yong’s great-grandfather returned to Singapore to take over the business. Ah Ma continued the storytelling with the memories of her youth; how she started helping out at Say Tian Hng when she married Tze Yong’s grandfather when she was just 18 years old. She recalled sitting next to her husband, quietly observing him at work and practising what she learnt. 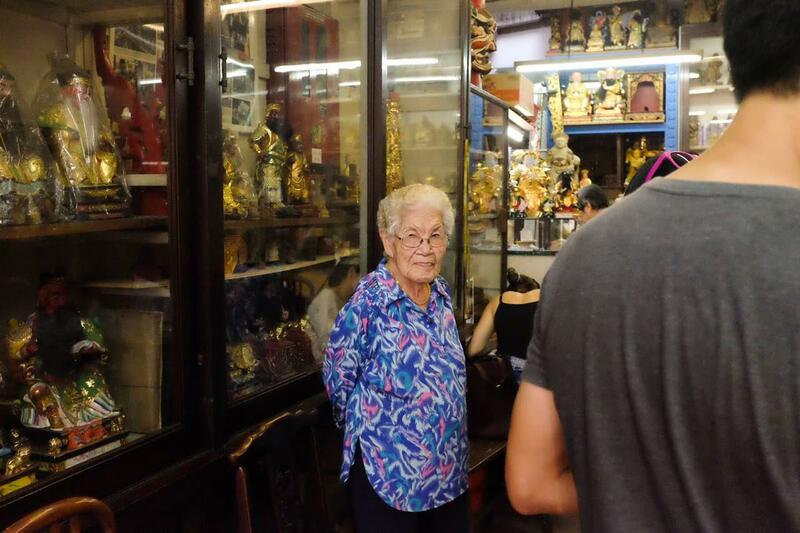 Ah Ma also remembered the times she sat in this very shop, with Tze Yong’s father as a baby on her lap while she sewed clothes for the family and served customers looking to buy effigies. 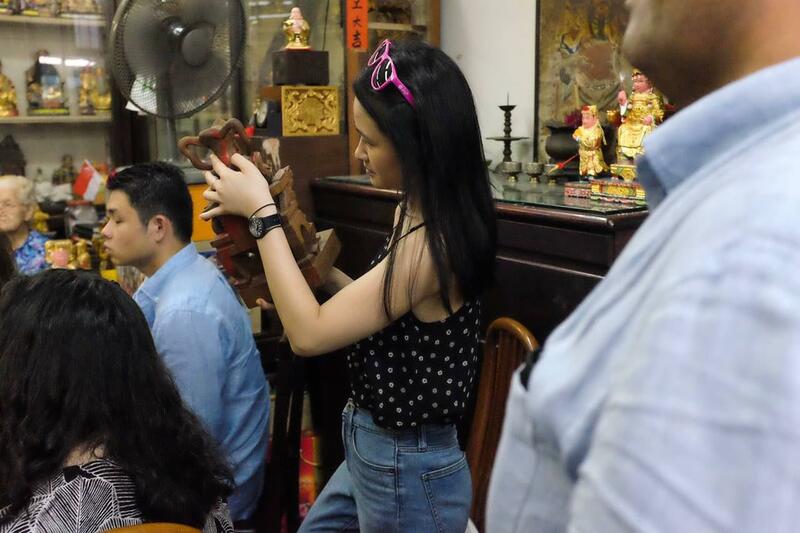 Now, she spends her days at the shop overlooking the business as Tze Yong’s father runs the business himself. When I asked him how he managed to rope in his daughters to help out, he said they were just passing out kueh and drinks at first. 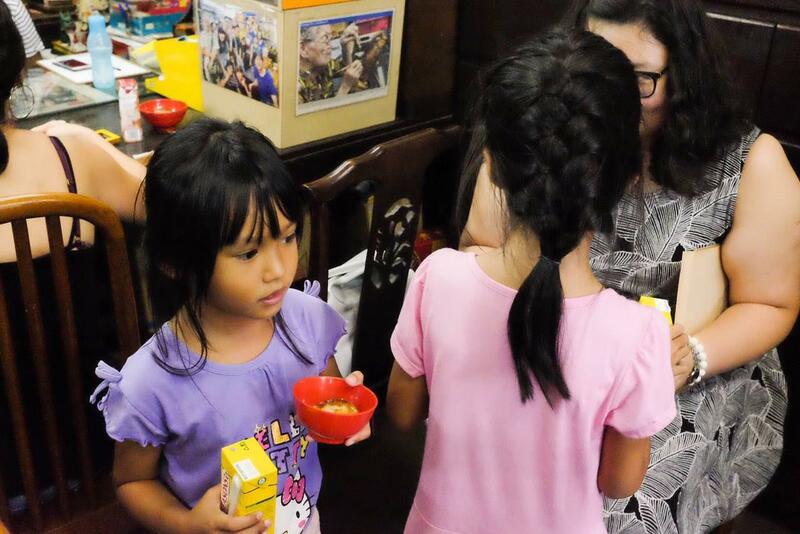 “The past two sessions I have also gotten my grandmother to do more sharing, as previously it was just me doing all the talking lah. But now that she’s able to [be more involved and interactive] makes it more meaningful too,” he added. Growing up, Tze Yong said that the future of the business has always been at the back of his mind but he doesn’t know if he’ll eventually take over the shop. His family has the common desire to continue the business, but “in what form”, he said he’s not sure. “Every Wednesday, my brother and I come down to learn the actual skill because when heritage businesses die, it’s not because there’s no customer,” he explained. There are still customers who want to patronise these heritage businesses it’s just that no one knows how to make it any more or [the next generation] has no interest or they cannot make a living doing it anymore. When he created the tour as part of his studies, he had to see the business in a different light, and as the tour went on, it gave him new perspectives. However, increasing the frequency of the Airbnb Experience is not a viable option. The tour has also become a time for his family to get together every month, and he doesn’t want to turn it into a chore by conducting this too often. 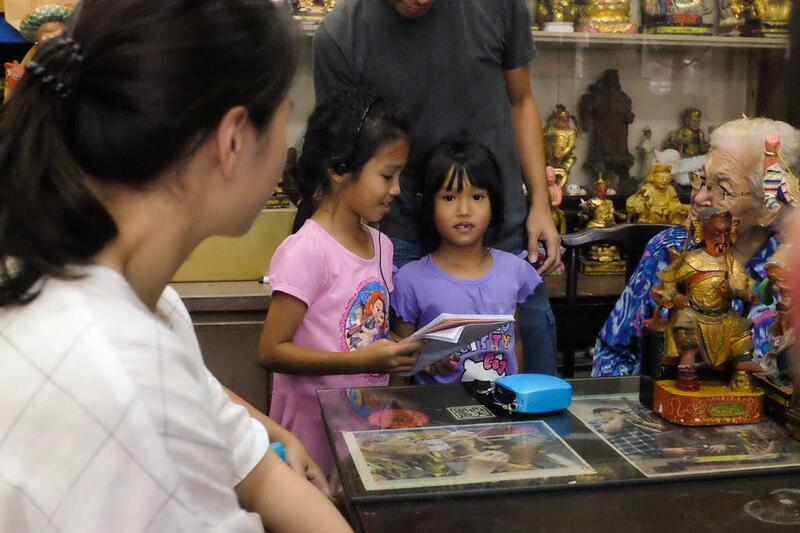 Since putting the workshop up on Airbnb Experience, they have seen a more diverse crowd patronising the store. 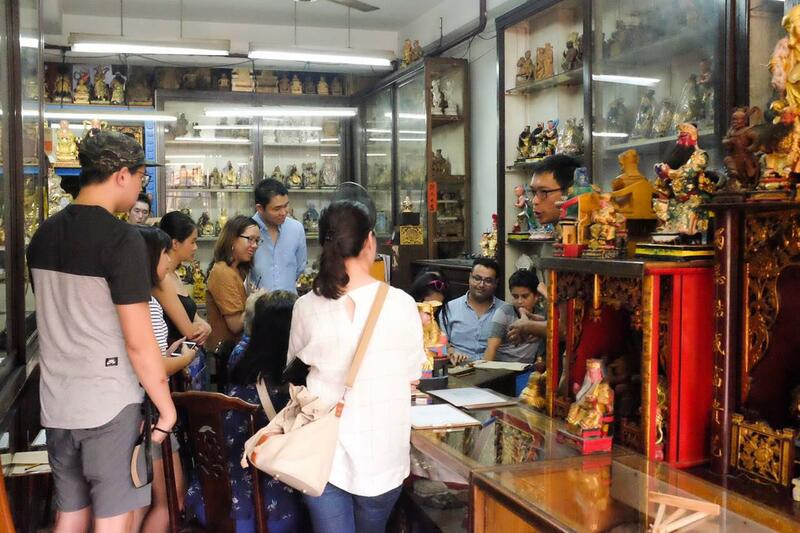 “Everybody who attends the Airbnb tour is not customers of the shop; they may not be Taoists and they’re all here for a different purpose,” Tze Yong said. You can sign up for their Airbnb Experience here, and to find out more about them, head to their website.